BLOG TALK: WHAT'S MY BLOG WORTH, ANYWAY? Nowadays, it seems like everyone and their mother has a blog and often these same bloggers offer sponsorships as well. For most people, this is a great way to make money on their blogs and it's also a great way to expose people to other great blogs, too. But there's the other side of blog sponsorships that I've been exposed to as well. I've heard from both blog sponsors and bloggers with sponsors that sponsorships aren't always a great fit for them. There are sponsors who have said that they didn't feel like they got their money's worth and bloggers who said that they felt like they had too much pressure to blog and meet deadlines/quotas to make their ad spaces worth buying. I can't really add my two cents to this debate because I haven't done either. I have done ad swaps in the past and have seriously considered sponsorships but have always decided against it in the end. It just never felt right for my blog. But as my blog archives fill up, I can't help but wonder about the worth of my blog. There are so many blogs out there that are smaller or newer than mine (is that rude to point out?) receive blog sponsorships and while I'm not jealous of the work that goes into sponsorships (hello, freedom to post whenever I want! ), I am a little jealous of the fact that they're earning money off their blogs. This is when my dad's saying, 'money isn't everything' plays in my mind. Money isn't everything and I think that's the first lesson that every teacher learns. But it is also kind of nice, you know? Especially when I think about the time and the work that I put into my blog. I, like almost all bloggers out there, spend nights and weekends writing posts, taking photos, editing photos, editing posts, and responding to emails and comments. Which is why I can't help but wonder about the worth of my blog. If I've got what it takes to pursue some sort of money-making venture. Not to make millions, but to just help pay for blogging e-courses, books for my shelf, or maybe even a pair of shoes every now and then. But I also want to do it in a way that is good for both me and my readers. I want it to be different and well, not-so-annoying or run of the mill. I don't feel like sponsorships are what I want right now, to be honest. I have thought about ads on my sidebar but don't know much about it. I know that a lot of style bloggers have affiliate links (or whatever they're called) but that's not something that a lot of lifestyle bloggers can really pull off. So I want to know what you think. Do you place worth on your blog? Do you see it as a job or a hobby? Do you sponsor blogs or offer sponsorships? What are your thoughts on all of this? I struggle with this. I'm really bad at the whole "if it becomes something I have to do I lose interest." Which is a character flaw I know. So my thing is trying to work through if I really do want my space to grow into something other than "me." I don't push the idea of sponsorship on my blog... I don't publish stats and things (for me it felt weird, like I was showing off or something... which I know turns some people away from asking because it's harder to find out info.) And I've done a few sponsor spots on others blogs, and depending on the blog, it was really worth it! But my whole thing is I don't want clicks, I want relationships. So I figure slow and steady I'll see what is going to happen with my little space. And I also love what you said about wanting friendships and not clicks. I wholeheartedly agree! You can have the numbers and the clicks, but to me, that's not nearly as amazing or life-changing as a friend and relationship with the people who read your blogs (and the bloggers behind the blogs you read, too). Oh, and slow and steady is my kind of pace. i think you're right - it's crazy that you've been blogging for about 4 years, and there are blogs that popped up in the last month making money off of sponsorships. i did swaps for a while and even a few feature spots, but i feel like you - it's not right for my blog. i don't want my blog to be my full time job and i don't want to not enjoy it because i feel obligated to put together feature posts or have guest posts. i love meeting other bloggers through swapping, but it has just become work and that's why i'm letting the ones set up through July finish and then i'm done. i want my blog to be a reflection of my life and a place for me to process life & create things. but really that's all i'm looking at it for! it's cool that other blogs make money and everything - but to me it's just not worth it. I'm glad you agree about the feature spots and swaps! I honestly feel like I did something bad in the blogging world, but it just didn't feel right to me. I also love what you said about wanting blogging to be something you truly and thoroughly enjoy. That's exactly how I feel, too. I felt like the swaps were swamping me and they weren't really having the effect that I was hoping, too. I felt like it was a let-down for the swappers more than anything! I have to put blinders on! I do not really understand how some blogs take off so incredibly fast. I am guessing that MY blog's unknowness is due to my lack of social media involvement....but then, it could be so many things! As far as making money goes, I WOULD love to make a little something but I don't know what that would look like in the long run. And I also get what you mean about wanting to make some money. I would love to do that, too! But for now, as much as I'd like the money, I don't think the options that I know of at the moment are what fits for me or my blog. Hey lady, GREAT thoughts! 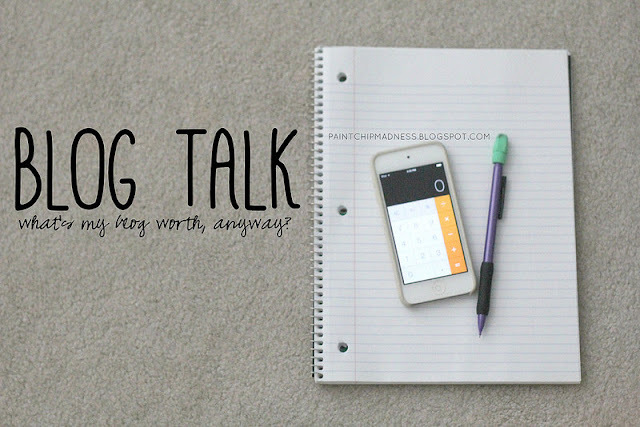 Your blog talk posts are some of my faves cause I can TOTALLY relate to you! Who knows, someday I might do blog sponsorships...we'll see. It DOES take a lot of time time to blog, and so to see a bit of a return back on that would be really great. But, for now, I don't want to do it...a while ago I was getting really caught up in the whole idea of it, and I don't love how I was viewing my blog. 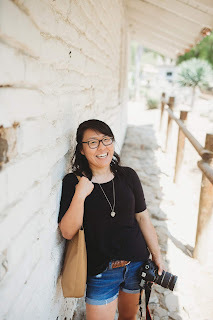 This may sound dumb, but watching the American Blogger really helped me to re-focus on why I write my blog, why I love it, and what I want to continue to write about. I have been writing for 6 years and have never made money, but always loved it...that is totally worth something to me! And you blog IS worth something...if you love it, if you enjoy the community that surrounds it, and if you are able to use it as a creative outlet. Not every blog can do sponsorships, and not every blog should. But as you said, it really isn't something I choose to do, too. I love what you said about getting caught up in the whole sponsorship thing and then re-focusing after watching American Blogger. That's great and I'm so glad you seemed to enjoy it as much as I did! You are 100% right! You have a great community of readers and it's bloggers like you who remind me that money isn't everything and that sponsorships aren't a must in the blogging world. I think a lot of bloggers (me included!) think that sponsorships are just a step in the blogging process. But it's a choice and like you, I'm choosing not to do it right now. On my personal blog i Just put blogs that i like on my sidebar, but on the Quiet Place we now do paid sponsorships because we put a lot of work into it and really work to develop good content for our readers. We talked about about it for a long time and we still enjoy blogging, we just think that if people really want to be on our sidebar, then they can pay for it. We put anything we get back into the blog,so it benefits our readers. We aren't making a ton with it right now, but i think it will get there in time. If you had paid sponsorship's,we would totally buy a spot, cause we love your content and we love you! I love that you put what you get back into your blog. For me, that's how I would use my hypothetical blogging money with. And that's where I feel like I would want to try sponsorships, you know? Not because I really want the money, but because it would be nice to have my blog be able to help support itself. Anyway, I'm glad it seems like you've come up with a system that works for you! ;) I'm not sure if that's the direction I'll take, but it is something I consider and re-consider every now and then! I think we should definitely place worth on are blogs. I think it's important to be aware of where your blog stands in comparison because it provides a healthy view of how the blog is doing so that you can set appropriate goals for growth (if that is something your interested in). Right now, I would have to say that I see my blog as a ministry, which is a little bit a job, and a little bit a hobby. Meaning that most of the time I'm working on it out of a desire to do so, and on occasion I'm working because things need to get done for the greater purpose of the ministry, encouraging other women. I don't handle the sponsorship side of the blog, but I think as far as all of that goes you just have to figure out what works best for you and your blog. Maybe some sponsorship types are too much for you to take on, or are not worth the time and effort it takes to do them. On the other hand there might be several different sponsorship styles that would fit great with your blog, I say just pick the one you like the most and go for it. You can always change your mind along the way. And thank you! I try to respond when I can and if you all take the time to comment, the least I can do is take the time to respond! I have gone back and forth on the idea of sponsoring and swaps. The thing is, I don't want to start ads just because it seems like everyone is doing it. I started writing and sharing on my blog to help process a difficult time in my life. Never in the five years of my blog have I been big or popular. However, I do know that some of my words have encouraged and influenced others. That is worth far more than dollars or cents. I also believe that the scope of my influence goes far beyond what I know. (and what I will know this side of Heaven.) Stats can never show the impact of on someone's heart. I love your blog. It is real, it is vulnerable, and it goes way deeper than many sponsored blogs. Also, thank you so very, very much for those sweet words about my blog! They were so touching and you've really just reminded me of why I blog. Thank you, thank you! after reading some of the comments...it's nice to know we aren't alone in our thought processes. sometimes getting $$ from blogging fits...other times it doesn't. i know we've chatted about this before but let me remind you - i LOVE your blog, it is full of worth to me; i love hearing what you have to say on a subject, seeing snips from your life, and hearing your heart. it is all so beautiful. i agree - sometimes i get frustrated when i see people just start a blog and then WAM BAM they start earning money. i have to remind myself that my content is MINE. and that i produce it when i feel inspired to - not because a deadline is approaching. of course i would love to make a few extra dollars off of the blog - but i haven't seen anything yet that has had me sit down and say "yes, i want to do this and earn some money". sponsorship isn't for me, and neither is posting just for the sake of "posting" if that makes sense. I definitely know what you mean about sponsorships and deadlines. I feel like while I could do sponsorships just because everyone else is, it's not something I'm passionate about or want my blog to turn into, either. And I also love what you said about worth not being numbers! I fall into that trap a loooot and it's been something that I've had to retrain my brain into remembering that numbers do not define me or my blog and that relationships and community are way more rewarding than numbers! I love that sponsorships work for you, too! I feel like it really does work for a lot of bloggers out there and know that it's not only something the bloggers enjoy doing, but something that can be of financial help, too. I also agree with you on what you said about money. That is so spot on and such a great reminder and something to really think about when it comes to blogging and just life in general! Lastly, what you said about worth and God was just amazing. I loved that you added that bit into the end of your comment because it is sooo true and something that I know I'll be reminding myself of, too. Thanks, Ashley!